Orungo virus (ORUV) belongs to the genus orbivirus in the family Reoviridae. Orbiviruses present a worldwide distribution, a large genetic diversity and are responsible for diseases of veterinary and human importance transmitted by a wide range of vectors including Culicoides and mosquito species . Orbiviruses have a nonenveloped, segmented, double-stranded RNA (dsRNA) genome coding 11 distinct proteins (VP1 to VP7 and NS1 to NS4) organized in 10 segments, the NS4 overlapping with the VP6 protein. Each segment is flanked by short 5’ and 3’ non-coding regions (NCRs) [1,2]. Although vaccines for Bluetongue virus (BTV), African horse sickness virus (AHSV) and Epizootic hemorrhagic disease virus (EHDV) exist in animals, no antiviral drugs are currently available for humans [3,4]. ORUV is a mosquito-transmitted orbivirus first isolated in 1959 from Anopheles funestus mosquitoes in Uganda and later from 8 humans and Aedes dentalus mosquitoes in Nigeria [5,6]. ORUV presents a large diversity with four distinct serotypes (ORUV-1 to ORUV-4) that are widely distributed in tropical Africa . It is responsible of a febrile disease with symptoms including headache, myalgia, nausea and vomiting and induces antibodies production between day 7 and day 14 post infection [5,7,8]. In addition, ORUV kills less than 10-days old mice and hamsters following intra-cranial inoculation and cause cytopathic effect (CPE) in Vero and BHK-21. However, it didn’t infect adult mice, hamsters and chickens by subcutaneous inoculation . In Africa, without BTV circulation notified in Algeria and Morocco in 2008 and 2009, respectively , no major orbivirus outbreak has been yet reported. Indeed, although high prevalence of ORUV neutralizing antibodies was reported in humans in CAR (88%) in 1979 and Southeastern Gabon (58%) in 1982, in Gambian population (up to 23%) in 1978-1979 and in food animals of Northern Nigeria (up to 30%) in 1984 [9-11], reported clinical human cases still rare. Herein, we report the first identification and isolation of ORUV from a patient in Southeastern Senegal in 2015 during arboviruses surveillance and the results of the comparative genome and phylogenetic analysis and mice experiments. 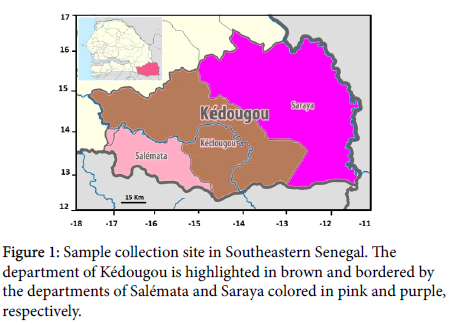 In February 2015, during arboviruses surveillance in Kédougou region, Southeastern Senegal, a blood sample was obtained from a 31- years-old man with a 3-days history of fever (38 °C) and headache (SH264542). The patient lived in the department of Kédougou at the onset of disease and had not traveled abroad Figure 1. The sample was analyzed at WHO collaborating centre (WHO-CC) for arboviruses and hemorrhagic fevers at the Institut pasteur of Dakar (IPD) using molecular and serological diagnostic methods for arboviruses and a neutralizing antibodies test for yellow fever virus was positive. The sample was later processed for high-throughput RNA sequencing at IPD. RNA was extracted from the serum using the QIAamp Viral RNA Mini Kit (Qiagen, Hilden, Germany). Briefly, viral RNA was fragmented and the Nextera XT library Prep kit (Illumina, San Diego, CA, USA) was used for strands synthesis, adapter ligation and libraries amplification according to the manufacturer’s recommandations (Illumina, San Diego, CA, USA). The amplified DNA library was analyzed using the 2100 Bioanalyzer instrument (Agilent Technologies, Santa Clara, CA, USA). The purified sequencing library was quantified using the KAPA library quantification kit (Kapa Biosystems, Wilmington, DE, USA) and subsequently sequenced on the Illumina MiSeq platform with 151 bp paired-end reads using the Miseq reagents kit v3 according to the manufacturer’s protocol (Illumina, San Diego, CA, USA). Because the protocol followed made use of randomly primed cDNA synthesis, it provided a comprehensive and quantitative view of all RNA present in the sample, thus enabling the characterization of a potential present virus. Illumina sequence reads were quality trimmed by Prinseq-lite, and de novo genome assembly was performed with IDBA (Iterative de Bruijn graph De Novo Assembler). Figure 1: Sample collection site in Southeastern Senegal. The department of Kédougou is highlighted in brown and bordered by the departments of Salémata and Saraya colored in pink and purple, respectively. Overlapping nucleotide sequences obtained from the 10 dsRNA genome segments of this human ORUV were assembled using the Unipro UGENE software . Multiple alignments of nucleotide sequences were carried out by using Muscle algorithm  within Unipro UGENE software. Based on these alignments, we investigated the genetic properties of this senegalese ORUV isolate, such as segments length and amino acid distances between available ORUV coding regions from Uganda in 1959 (isolate UGMP 359, Genbank acc. no. JQ610675-84) and sequences of the new characterized ORUV isolate.We also assessed amino acid differences in coding regions. A Bayesian phylogenetic analysis for estimation of data quality and selection of the best-fit nucleotide substitution model were performed using Model Finder test  on the IQ-TREE 1.6.3 web server . The maximum likelihood (ML) tree was then constructed with sequences of VP1 (RNA-dependent RNA polymerase) and VP3 (T2, Major subcore Protein) proteins representing the two most conserved genes between orbiviruses. Tree was inferred using Fast Tree v2.1.7  with the best fit nucleotide substitution model to our sequence data. Nodes were labeled with local support values, which were computed with the Shimodaira-Hasegawa test (SH-like) for 5000 replications. Topology was visualized by FigTree v.1.4.2. Twenty microliter of the filtrated serum was inoculated by intracerebral route into 10 Swiss suckling mice (1–2 days old) at animal laboratory of the IPD authorized by the national ethical committee in Senegal to use virus isolation in suckling mice for surveillance, routine diagnostic and research of viruses. Infected mice were followed for 21 days post infection (dpi). In addition, 150 μl of filtrated serum were inoculated onto confluent Vero cells (African Green Monkey Kidney) monolayer (25 cm) in Leibovitz 15 (L-15) growth medium supplemented with 5% fetal bovine serum (FBS) (both GibcoBRL, Grand Island, NY, USA), and 10 mM each of Penicillin and Streptomycin (Sigma, Gmbh, Germany). Inoculated cells were incubated at 37 °C for a maximum of 7 days and cells were collected until observation of a CPE. In order to assess ORUV infection, cells were tested by indirect immunofluorescence assay (IFA) using specific hyper-immune mouse ascitic fluid for different orbiviruses including Orungo, Palyam, Acado, Kindia, Gomoka, Andesibe, Pata, Ndelle, Ngoupe and Sanar, as previously . Viral RNA was extracted from initial serum, culture supernatant from infected Vero cells and suckling mice brain using the QIAamp viral RNA mini kit (Qiagen, Heiden, Germany) according to manufacturer’s instructions. Extracted RNA was tested by real-time reverse transcription-polymerase chain reaction (RT-PCR) as previously described  using Bluetongue virus and Corriparta virus as positive controls. Subsequently, 5 μL of each PCR products were analyzed by gel electrophoresis on 1 % agarose gels stained with ethidium bromide to check the size of amplified fragments by comparison to a DNA molecular weight marker (HyperLadder™ 1kb, Bioline, USA). The DNA bands from the PCR amplification were purified (QIAquick Gel Extraction Kit, Qiagen, Heiden, Germany) and sequenced (Beckmann Coulter, UK). In order to design an assay capable of detecting ORUV, both primers and TaqMan probe were designed on VP1 segment of the ORUV sequence available from Uganda (GenBank Ac.No.JQ610675) using Primer3web® software (version 4.0.0, Whitehead Institute for Biomedical Research). To avoid non-specific cross-reactions with others orbiviruses, primers and probe were validated by BLAST analysis on NCBI. Oligonucleotides were synthetized by TIBMol-Biol (Berlin, Germany) (Table 1). Table 1: Oligonucleotide sequences of primers and probe designed for Orungo virus detection. Briefly, real-time RT-PCR was performed using the Quantitect Probe RT-PCR kit (Qiagen, Hilden, Germany) in a 20 μl reaction mixture containing 2x QuantiTect probe RT-PCR master mix, 0.25 μl of QuantiTect RT mix, 400 nM PCR primers, 200 nM TaqMan probe and 5 μl RNA in RNase-free water. Positive control containing master mix with ORUV RNA and negative control consisting of master mix with sterile RNase-free water were included in each run. The reaction was carried out on a 7500 Fast Real Time system cycler or on a 7500 Real Time system cycler (Applied Biosystems, Foster City, US) using the following temperature profile: 1 cycle of reverse transcription at 50 °C for 10 min, 1 cycle of denaturation at 95 °C for 15 min, followed by 40 cycles of 95 °C for 15 s and 60 °C for 1 min. In addition, a total of 11 other major representatives of orbiviruses including Bluetongue, Corriparta, Palyam, Acado, Kindia, Gomoka, Andesibe, Pata, Ndelle, Ngoupe and Sanar and obtained from the archive of the WHO-CC at IPD were also used for specificity testing. The initial serum, culture supernatant from infected Vero cells and suckling mice brain were tested in duplicates by real time RT-PCR. Ten-fold serial dilutions (10-1 to 10-11) of the serum sample were prepared in maintenance medium L-15 supplemented with 5% FBS and virus titer in initial serum was determined in plaque forming units by milliliter (PFU/mL) by inoculation onto Vero cells as previously described . Furthermore, 20 μl Vero-grown ORUV containing 103 PFU/mL of the virus was inoculated into 4 Swiss adult mice (up to 4-weeks old) by group through intracerebral, intraperitoneal and subcutaneous route. Control groups were inoculated with 20 μl of 1x phosphate buffer saline (PBS). The animals were observed daily for illness and followed for 21 dpi and the experiments were undertaken two times. Finally, sera, brain, liver and spleen from animals euthanized at 21 dpi were tested in duplicates for ORUV infection by real time RT-PCR. Surprisingly, de novo assembly of the sample reads revealed an Orungo virus genome from this human serum (ORUV; SH264542) and assembled segments sequences were deposited in GenBank (Accession numbers: MH477874-83). The likelihood of sample contamination is small, since the sequencing run hadn’t included any material containing ORUV nor none of the additional RNA samples which were treated at the same time provided sequence reads that corresponded to ORUV. Analysis of complete coding sequences of the new characterized ORUV was performed at amino acid level including previously available sequences from Uganda in 1959 (Genbank accession number JQ610675-84) into multiple sequences alignment. The protein length was determined with respect to coding regions size and amino acid distances were ranged from 0 to 6%, with the highest distances observed at proteins VP1, VP3 and VP6 (Table 2). Table 2: Comparative analysis of coding regions lengths of the new human ORUV isolate. In addition, the highest numbers of non-conservative amino acid substitutions were located on proteins VP1, VP2, VP3 and VP6 with 18, 11, 9 and 9 mutations, respectively. Interestingly, sequences of the new characterized ORUV isolate showed gaps of 50 and 23 amino acids at VP1 and VP3, respectively when compared with sequences from Uganda (Table 3). Table 3: Summary of non-conservative amino-acid changes in the various putative coding regions encoded by the Senegalese ORUV genome relative to those of the isolate from Uganda in 1959. The General Time-Reversible with a Gamma distribution of 4 categories rate (GTR+F+G4) was the best nucleotide substitution model for our sequences data presenting scores of 103,978.11 and 95,928.15, 103,590.62 and 95,566.50, 103,592.20 and 95,567.87 for Bayesian information criterion score (BIC), Akaike information criterion score (AIC) and corrected AIC score (AICc) criteria using our VP1 and VP3 sequence datasets, respectively. The maximum likelihood (ML) trees was inferred using FastTree v2.1.7  and phylogenetic analysis revealed that this new characterized ORUV (ORUV_SN_SH264542) belongs to Culicoides-borne orbiviruses group, clustering closely with the ORUV isolate sampled in Uganda in 1959 (Figure 2). Figure 2: Maximum Likelihood (ML) trees inferred on complete sequences from VP1 (A) and VP3 (B) proteins of orbivirus groups. Phylogenetic trees were constructed using FastTree and nodes were labeled with local support values computed using the Shimodaira- Hasegawa (SH) test for 5000 bootstrap replications. 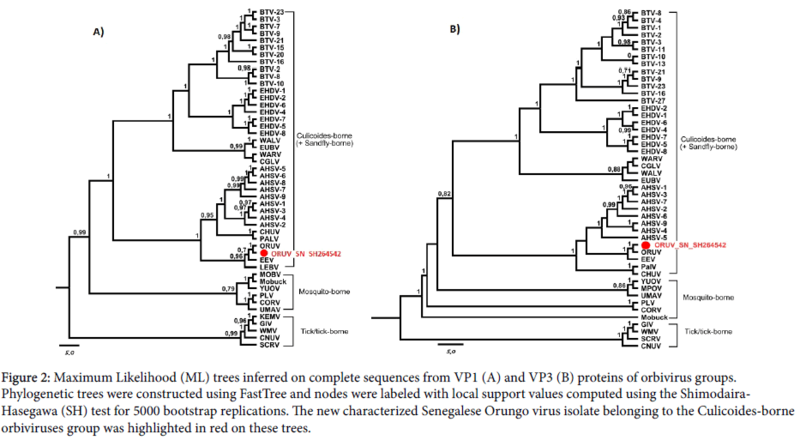 The new characterized Senegalese Orungo virus isolate belonging to the Culicoides-borne orbiviruses group was highlighted in red on these trees. We observed mortality at 4 dpi in suckling mice inoculated with 20 μl of the initial serum. In addition, the inoculated Vero cells developed a CPE within 6 dpi, indicating virus growth. Immunofluorescence assay showed that this serum cross-reacted only with ORUV specific hyper-immune ascitic fluid and not with other tested orbiviruses important in African context (Figure 3). 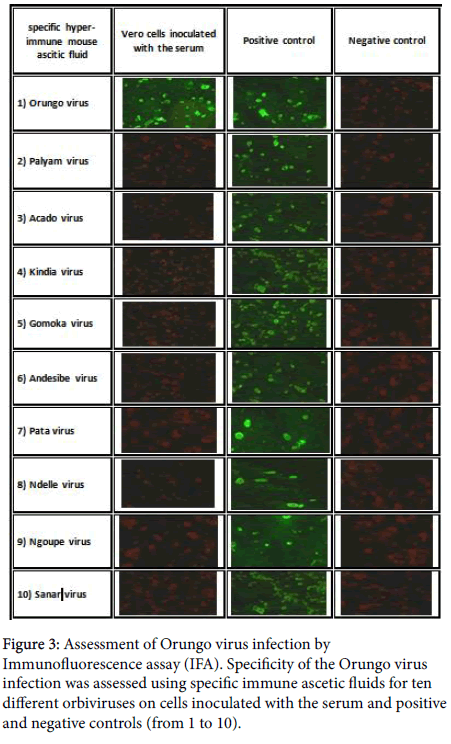 Figure 3: Assessment of Orungo virus infection by Immunofluorescence assay (IFA). Specificity of the Orungo virus infection was assessed using specific immune ascetic fluids for ten different orbiviruses on cells inoculated with the serum and positive and negative controls (from 1 to 10). The designed primer pair and probe exhibited no cross-reactivity with other species of orbivirus genus. The initial serum, culture supernatant from infected Vero cells and suckling mice brain were tested positive by conventional and real time RT-PCR and confirmed the ORUV positive serum (ORUV_SN_SH264542). However, the virus was not detected in any sera and tissues from adult mice euthanized at 21 dpi (Table 4). Table 4: Specificity assessment of Orungo virus assay and tropism evaluation Viral characterization. The plaque assay determined a titer of 5.75 x 104 PFU/ml in the initial serum (ORUV_SN_SH264542) and no CPE was observed in the negative control culture (Figure 4). The ORUV inoculum was tested negative for mycoplasma sequences using PCR (data not shown). However, no illness was observed at 21 dpi after intracerebral, subcutaneous and intraperitoneal inoculation of adult mice. 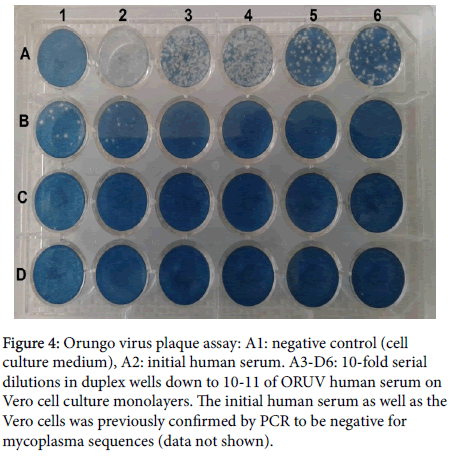 Figure 4: Orungo virus plaque assay: A1: negative control (cell culture medium), A2: initial human serum. A3-D6: 10-fold serial dilutions in duplex wells down to 10-11 of ORUV human serum on Vero cell culture monolayers. The initial human serum as well as the Vero cells was previously confirmed by PCR to be negative for mycoplasma sequences (data not shown). Our study is the first in Senegal identifying human infection caused by Orungo virus, an orbivirus responsible for diseases of veterinary and human importance. We found evidence of locally acquired infection with ORUV in Senegal through antigenic typing and sequencing, which raises the issue of the risk of circulation of the ORUV and human infection in Southeastern Senegal. These data also highlight the potential usefulness of high-throughput sequencing, particularly untargeted approaches, for pathogen surveillance . Our phylogenetic analysis indicated a strong VP1 and VP3 sequence homology between this Senegalese ORUV isolate and the isolate from Uganda, despite evidence of amino acid differences observed in these major proteins such as gaps. Cumulated with evident gene exchanges (reassortment) occurring in orbiviruses replication cycle [2,21-23], these sequences modifications may lead to differences in viral fitness and cause more or less severity in illness presentation. Thus, more studies need to be carried out on a large number of samples from a broader spectrum of diseases other than Yellow fever suspicion, with complete clinical records, to study the pathogenic determinants of this virus. In addition, other forces driving orbiviruses evolution such as intragenic recombination reported for Bluetongue virus , could be also assessed in future studies focusing on ORUV diversity. Although the Senegalese ORUV isolate showed lethality to suckling mice when injected intra-cerebrally, results of pathogenicity experiments in adult mice indicated that ORUV illness can’t occur from the intra-cerebral, intra-peritoneal and intra-muscular routes of injection as in a previous study . In addition, viral absence in tested tissues could be explained by ORUV tropism different to brain, liver and spleen or viral clearance by the host’s immune system. However, it could be interesting to perform further experiments with higher viral doses in less than 10-days old mice inoculated by subcutaneous route or in other animal models such as sheep. Since both the vectors and suitable hosts (e.g., Culicoides) for orbiviruses are present in Senegal [25-27], more studies of this viral genus in this locality, including serosurveillance, are needed. Increasing levels of population movement inside Senegal and between Southeastern Senegal and other counties which features a rich diversity of arthropod species implicated in the maintenance and transmission of arboviruses of medical interest [28,29] may provide opportunities for pathogens to expand their geographical distribution. Cumulatively, this isolation from febrile human indicates that ORUV may be a health risk for humans and other mammals, and future strategies of vaccine or antiviral development against orbivirus genus in Africa should consider these possibilities. Despite a previous suggestion that the dsRNA viruses have evolved by co-evolution with their respective hosts , recent studied provided evidence for co-evolution of the orbiviruses with their arthropod vectors rather than their vertebrate host [2,31]. Thus, it could be interesting to assess also vector competency of potential ORUV vector groups circulating in Southeastern Senegal [3,32]. Since ORUV could emerge or re-emerge in geographically distinct locations, outside its original geographical boundaries as other orbiviruses or with new clinical onsets, this new molecular diagnostic assay have been developed to assist in broad identification of ORUV and diagnosis in livestock and/or wildlife, and to enhance a rapid response to this emerging pathogen, if necessary. Our complete genome could provide a resource for further studies on biological and pathogenic properties and its possible association with human diseases, even during outbreaks or circulations of arbovirus species such as Yellow fever virus. This research received no specific grant from any funding agency in the public, commercial, or not-for-profit sectors and was only supported by the Institut Pasteur of Dakar. We acknowledge colleagues of virology pole of Institute Pasteur de Dakar, Senegal for sharing serum and supportive information necessary for establishment and accomplishment of this study. “The authors declare no conflict of interest." Martin Faye, Amadou Alpha Sall and Ousmane Faye conceived and designed the experiments. Martin Faye, Arame Ba, Andre Pouwedeou Bedekelabou, and Yakhouba Kane performed the experiments. Martin Faye, Mamadou Diop and Moussa Moise Diagne analyzed the data. Gamou Fall, Oumar Faye, Amadou Alpha Sall and Ousmane Faye contributed reagents/materials. All authors wrote the paper. All authors read and approved the final manuscript. Attoui H, Mertens PPC, Becnel J, Belaganahalli M, Bergoin M, et al. (2011) The Double Stranded RNA Viruses. In: King AMQ, Carstens EB, Lefkowitz EJ (eds) Virus Taxonomy: Ninth Report of the International Committee on Taxonomy of Viruses, London Academic Press, pp: 497-637. Mohd Jaafar F, Belhouchet M, Belaganahalli M, Tesh RB, Mertens PPC, et al. (2014) Full-genome characterisation of orungo, lebombo and changuinola viruses provides evidence for co-evolution of orbiviruses with their arthropod vectors. PLoS ONE 9: e86392. Attoui H, Mohd Jaafar F (2015) Zoonotic and emerging orbivirus infections. Revue scientifique et technique 34: 353-61. OIE (2014) Bluetongue. In: Terrestrial Manual, World Assembly of Delegates of the OIE, USA. Tomori O, Fabiyi A, Murphy F (1976) Characterization of Orungo virus, an Orbivirus from Uganda and Nigeria. Arch Virol 51: 285. Brown SE, Morrison HG, Karabatsos N, Knudson DL (1991) Genetic relatedness of two new Orbivirus serogroups: Orungo and Lebombo. J General Virol 72: 1065-1072. Tomori O (1978) Orungo virus of the orbivirus taxon. Experimental sheep infection and neutralizing antibodies in domestic and wild animals in Nigeria. British Veterinary J 134: 108-112. Tomori O (1978) Response of Erythrocebus patas monkeys to experimental infection with the orbivirus Orungo virus. Transac Royal Society of Tropical 72: 230-233. Saluzzo JF, Ivanoff B, Languillat G, Georges AJ (1982) Serological survey for arbovirus antibodies in the human and simian populations of the South-East of Gabon. Bulletin de la Societe de Pathologie Exotique et de ses Filiales 75: 262-266. Ezeifeka GO, Umoh JU, Belino ED, Ezeokoli CD (1984) Complement fixing antibodies to Orungo virus in food animals of Northern Nigeria. Int J Zoonoses 11: 149-154. Monath TP, Craven RB, Adjukiewicz A, Germain M, Francy DB, et al. (1980) Yellow fever in the Gambia, 1978-1979: Epidemiologic aspects with observations on the occurrence of Orungo virus infections. The American J Tropical Medecine and Hygiene 29: 912-928. Okonechnikov K, Golosova O, Fursov M (2012) The UGENE team. Unipro UGENE: A unified bioinformatics toolkit. Bioinformatics 28: 1166-1167. Edgar RC (2004) MUSCLE: Multiple sequence alignment with high accuracy and high throughput. Nucleic Acids Research 32: 1792-1797. Kalyaanamoorthy S, Minh BQ, Wong TKF, von Haeseler A, Jermiin LS (2017) ModelFinder: Fast model selection for accurate phylogenetic estimates. Nature Methods 14: 587-589. Trifinopoulos J, Nguyen LT, von Haeseler A, Minh BQ (2016) W-IQ-TREE: A fast online phylogenetic tool for maximum likelihood analysis. Nucleic Acids Research 44: W232-W235. Price MN, Dehal PS, Arkin AP (2010) FastTree 2: Approximately Maximum-Likelihood Trees for Large Alignments. Plos One 5: e9490. Digoutte JP, Calvo-Wilson MA, Mondo M, Traore-Lamizana M, Adam F (1992) Continuous cell lines and immune ascitic fluid pools in arbovirus detection. Research in Virol 143: 417-422. Palacios G, Cowled C, Bussetti AV, Savji N, Weir R, et al. (2011) Rapid molecular strategy for orbivirus detection and characterization. J Clin Microbio 49: 2314-2317. Fall G, Di Paola N, Faye M, Dia M, Freire CCdM, et al. (2017) Biological and phylogenetic characteristics of West African lineages of West Nile virus. PLoS Neglected and Tropical Diseases 11: e0006078. Gardy J, Loman NJ, Rambaut A (2015) Real-time digital pathogen surveillance-the time is now. Genome Biology 16:155-155. Belaganahalli MN, Maan S, Maan NS, Pritchard I, Kirkland PD, et al. (2014) Full Genome Characterization of the Culicoides-Borne Marsupial Orbiviruses: Wallal Virus, Mudjinbarry Virus and Warrego Viruses. PLoS ONE 9: e108379. Belaganahalli MN, Maan S, Maan NS, Tesh R, Attoui H, et al. (2013) Full genome sequencing of Corriparta Virus, identifies California Mosquito Pool Virus as a member of the Corriparta virus species. PLoS ONE 8: e70779. Attoui H, Mertens PPC, Becnel J, Belaganahalli M, Bergoin M, et al. (2012) Reoviridae. Elsevier Academic Press, London, UK. He CQ, Ding NZ, He M, Li SN, Wang XM, et al. (2010) Intragenic Recombination as a Mechanism of Genetic Diversity in Bluetongue Virus. J Virol. 84: 11487-11495. Temmam S, Monteil-Bouchard S, Robert C, Baudoin JP, Sambou M, et al. (2016) Characterization of viral communities of biting midges and identification of novel Thogotovirus species and Rhabdovirus genus. Viruses 8: 77. Zientara S, Weyer CT, Lecollinet S (2015) African horse sickness. Revue scientifique et technique 34: 315-327. Jacquet S, Garros C, Lombaert E, Walton C, Restrepo J, et al. (2015) Colonization of the Mediterranean basin by the vector biting midge species Culicoides imicola: An old story. Molecular Ecol 24: 5707-5725. Monlun E, Zeller H, Le Guenno B, Traoré-Lamizana M, Hervy JP, et al. (1993) Surveillance of the circulation of arbovirus of medical interest in the region of eastern Senegal. Bulletin de la Societe de Pathologie Exotique et de ses Filiales 86: 21-28. Althouse BM, Hanley KA, Diallo M, Sall AA, Ba Y, et al. (2018) Role of monkeys in the sylvatic cycle of chikungunya virus in Senegal. Nature Communications 9: 1046. Attoui H, Fang Q, Mohd Jaafar F, Cantaloube JF, Biagini P, et al. (2002) Common evolutionary origin of aquareoviruses and orthoreoviruses revealed by genome characterization of Golden shiner reovirus, Grass carp reovirus, Striped bass reovirus and golden ide reovirus (genus Aquareovirus, family Reoviridae). J Gen Virol 83: 1941-1951. Belhouchet M, Mohd Jaafar F, Tesh R, Grimes J, Maan S, et al. (2010) Complete sequence of Great Island virus and comparison with the T2 and outer-capsid proteins of Kemerovo, Lipovnik and Tribec viruses (genus Orbivirus, family Reoviridae). J General Virol 91: 2985-2993. Tomori O, Aitken TH (1978) Orungo virus: Transmission studies with Aedes albopictus and Aedes aegypti (Diptera: Culicidae). J Medical Entomol 14: 523-526.